With the increasing availability of information and the importance of lifelong information literacy (IL) skills, instructional designers, school media specialists, and librarians need to determine how to best design IL teaching in order to help students locate, evaluate, and use information more effectively. 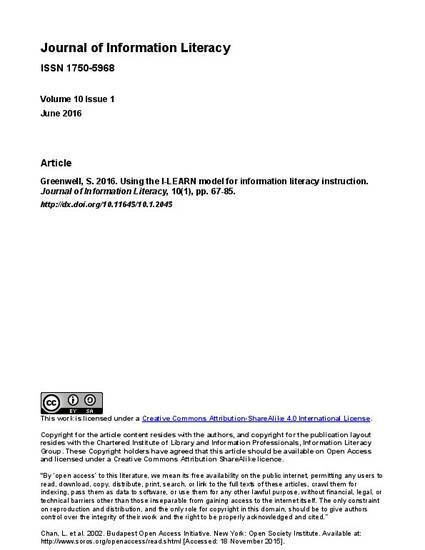 This paper describes the first experimental research study conducted to determine how teaching designed using the I-LEARN model could increase student understanding and application of IL concepts and offer recommendations for future implementations of the model. The experimental study described in this article examined whether IL skills teaching designed using the I-LEARN model increased student understanding and application of IL concepts. The experimental group received an instruction session and a library research guide designed using the I-LEARN model, and the control group received an instruction session and a library research guide designed using a systems model. While the analysis of the results of pre- and post-test scores and scores on a citation analysis showed that there was no significant difference between the two groups, students in the experimental group used the I-LEARN-designed research guide more often than students in the control group and self-reported benefits of using the I-LEARN-designed research guide. Published in Journal of Information Literacy, v. 10, no. 1, p. 67-85. Copyright for the article content resides with the authors, and copyright for the publication layout resides with the Chartered Institute of Library and Information Professionals, Information Literacy Group. These Copyright holders have agreed that this article should be available on Open Access and licensed under a Creative Commons Attribution ShareAlike licence.